High Visibility Rope gate way for electric fences. Useful for horses or livestock that are inclined to "not see" conventional electric fence gate ways. The rope will extend up to 5 meters to cover very wide gate ways. 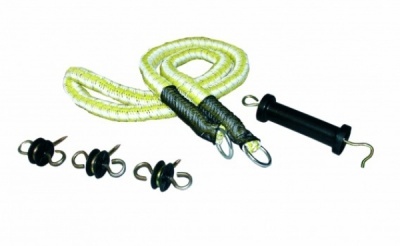 This is an alternative to the spring gate set and is ideal for horses who can get caught in traditional spring gates. The elasticated rope has steel conductors woven in to it so the gate will provide a shock and carry the power over the gate way.